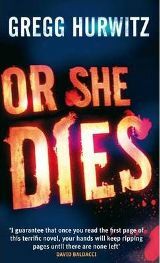 Or She Dies is Gregg’s latest thriller published 2009. The plot centres around Patrick Davis, a screenwriter who has turned to teaching screenwriting at Northridge University following a legal complaint against him, his agent dropping him and subsequently finding himself suffering from writer’s block. Patrick’s marriage is not going too well either and he has taken to sleeping on the sofa every night. So when he receives a DVD in the post which shows footage of him and his wife Ariana in the house going about their business, Patrick’s life becomes even more complicated and stressful than it is already. What follows surprises Patrick as he carries out what is asked of him and nothing bad or untoward actually happens to him. In fact it is the opposite, as Patrick actually feels he is doing good, and wonders if he has in fact been chosen for some reason to help people. He remains confused, he has no answers nor any idea what is happening or why. Should he refuse to complete any more tasks until he has answers? And what will happen if he does say no? I found Or She Dies to be a very good thriller, with a few good twists and turns which was a big factor in my enjoyment of the book. As I mentioned earlier, I am a fan of Harlan Coben and he does give an endorsement to this novel stating it is nail-biting and stay-up-all-night suspense. Whilst I feel that can certainly be said about the second half of the book I am not sure I would say that about the first half. This is because although the book starts well and drew me in from the first page, it then seems to slow down a little, and contained in my opinion perhaps a little too much detail to Patrick’s working day at the University, and his colleagues. Also, Patrick and his wife Ariana are having marriage problems and are not really talking, just exisiting together. Again I felt that a little too much detail was given to Patrick’s marriage troubles. I did find myself getting slightly bored of it. However, the book does pick up pace again when the emails begin to arrive, and the second half of the book certainly contained more suspense and action, as Patrick’s marriage problems and his work are no longer his main concern. I found that from this point onwards I did not want to put the book down, as it took a twist which I had not foreseen, and did indeed become nail-biting as I raced through the pages. A few things followed which again I could not have predicted, and I was by now well and truly hooked. The book pulled me along, and as well as making you think about what is unfolding in the plot, it also takes in some wider issues also. I did have to stop and think about some of the ‘technical stuff’ that was described but Hurwitz explains it well enough. I just had to slow down a little while reading it! The characters are well developed. Both Patrick and his wife are flawed people, but Patrick became quite a strong and likeable person, despite the fact I did not particularly warm to him in the first couple of chapters. There were parts of the book where he frustrated me but it made for a thrilling storyline. The character of Ariana, Patrick’s wife I thought was a little shallow at first. Her reasons for having an affair I thought were silly, and I could not really find an affinity to her the way she was portayed, but again this changed as the story went on. What happens brings her and Patrick closer, and as they became closer she appeared more interesting. When it becomes apparent her life is at risk I found myself caring for both of them. I enjoyed the character of Detective Sally Richards who was a breath of fresh air compared to some of the usual Detectives that feature in crime or thriller novels. Richards believes in Patrick despite the bizarre things he tells her. Despite being taken of the case, she does not give up on him, which can also prove to be her downfall. Or She Dies begins with domestic problems and bizarre threats, it does build to something far greater as Patrick discovers he’s been treated as a pawn in someone else’s game. The tension picks up pace and towards the end I can guarantee the reader will be coming up with potential endings as I was, and being wrong on all counts as the twists continue right to the end. With this book, Gregg Hurwitz has delivered a tense thriller which gathers pace to almost roller-coaster speed by the end, which ensures you will find it hard to put down. No Comments on "Or She Dies"